Analyzing and evaluating are needed in everyday life especially in cognitive tasks such as comprehension and making smart decisions. Both are also involved in data science as they deal with critiquing evidence. Moreover, they work hand in hand as analyzing is needed in coming up with an efficient evaluation. Thus, these interrelated processes are evident in how we understand and appreciate information. “Analyze” and “evaluate” are two crucial key terms in knowledge objectives as these are needed in actualizing higher order thinking skills. For instance, students are required to analyze theories, issues, experiences, and other related concepts. Also, learners are tasked to make a stand and elucidate on their judgments. Indeed, analyses and evaluations are key processes in learning and are essential in the advancement of disciplines. The root word of analyzing is based on the French word, “analyse” which means “to dissect”. It is also from the Greek words, “ana” (a breaking up) and “lysis” (a loosening). As it name suggests, it is the process of determining the valuable components of a certain concept. To analyze something is to determine its factors, effects, causes, importance, etc. Descriptive: It is a quantitative description of commonly large data which basically demands less effort as compared to the other types. Exploratory: This type seeks to reveal data connections. Inferential: It tests theories and generally tests the responses of a sample population. Predictive: This analyzes current and past information to predict future values. Causal: Analyzing causality entails testing how a variable is affected by another. Mechanistic: As compared to the other types, mechanistic analysis demands the most effort as exact changes of variables among individual objects need to be tested. Evaluating came from the French word, “évaluer” which means “to find the value of”. Hence, evaluating is the process of verifying something’s worth or significance. It assesses standards such as goodness, usefulness, feasibility, and validity with the objective to improve performance and achieve wise choices. -Needs Assessment: Evaluates who or what need certain training as well as the skill sets that still need to be learned. -Process Evaluation: Assesses the operation of programs or implementation of activities. -Outcome Evaluation: Determines to what extent are the goals being met such as the degree of addition or modification of knowledge, skill, values, and the like in a short-term setting. -Impact Evaluation: Verifies long-term impacts which usually affect a wider range of population as compared to the outcome evaluation. The main difference is that analyzing involves breaking a concept into its parts for better interpretation while evaluating requires determination of significance. The inference from analyses concerns interpretations as to implications, meanings, and justifications. On the other hand, the inference from evaluations look into the assessments of quality. Generally, analyzing comes first before evaluating. In order for you to ascertain the worth, you have to identify the elements. For instance, a real estate agent can only identify the price of a property if he already knows its location, measurement, scarcity, and other features. Typically, the output of an evaluation should be the resulting quality. On the contrary, a result is not that compulsory in analysis as it only mainly involves interpretation. Analyzing usually includes a longer thinking process as it deals with segmentation and classification while evaluating basically deals with the conclusion. Evaluating is more related with testing as compared to analyzing. To evaluate is to judge something’s worth while to analyze is to study the data. The end-product of an evaluation is a conclusion whereas the result of an analysis is a better understanding. A subjective perspective is more likely to influence the evaluating process as compared to the analyzing process since making judgments may involve emotions. Analyzing is more often done in academic researches as compared to evaluating as the academe is usually concerned with in-depth studies. Assessing the pros and cons is mostly associated with evaluating as it needs to weigh both sides in coming up with a verdict. Analyzing is more concerned with identifying relationships of elements while evaluation focuses on efficiency. Most of the key words related with analyzing are categorize, compare, relate, examine, and differentiate. 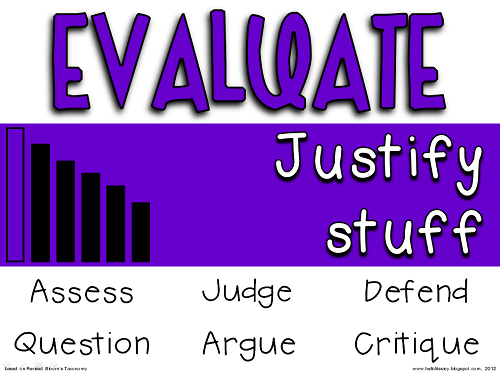 On the other hand, the key words for evaluating are judge, assess, solve, critique, and rate. Analyzing and evaluating are needed in daily life as well as in the improvement of disciplines. 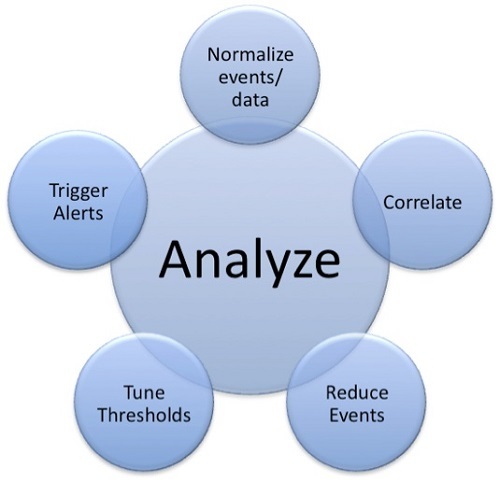 Typically, there are six types of analysis: descriptive, exploratory, inferential, causal, predictive, and mechanistic. Evaluation is generally typified as either formative or summative. Analyzing interprets data as it deals with meanings and implications while evaluating assesses something’s worth. Hence, results are more compulsory for the evaluating process. Analyzing comes first before evaluating. Analysis largely involves a longer thinking process as compared to evaluation. Analyzing is more often employed in academic researches as it is closely associated with objectivity. Identifying relations is more associated with analyzing. The key words for analyzing are categorize, relate, and differentiate whereas the ones for evaluating are judge, assess, and critique. gene balinggan. "Difference between Analyzing and Evaluating." DifferenceBetween.net. February 26, 2018 < http://www.differencebetween.net/business/planning-activities/difference-between-analyzing-and-evaluating/ >. Abott, Stephen. Understanding Analysis. New York: Springer-Verlag, 2015, Print. Alcock, Lara. How to Think about Analysis. Oxford: Oxford University Press, 2014. Print. Bloom, Martin, Fisher, Joel, and Orme, John. Evaluating Practice. London: Pearson,2009. Print.